It's been three years today since my grandmother, Beverly, died. In some ways, it seems like it's been a long time since I last saw her, but in other ways, it seems like we were together just yesterday. Grammy was such a big part of my life. She was always there for me and my brother. As early as I can remember, she was at our house, and we would go to her house. When we got older, we would get to have fun sleep-overs at her house. As we got even older, she was there to help us, give us advice, and celebrate our successes, as well as comfort us and reassure us after our failures. I remember staying overnight at her house when I was in high school just because I wanted to. I'd spend Saturday nights on her couch, doing my homework, watching Star Trek the Next Generation and Amen and 227 with her. She would sit nearby, a crossword puzzle and erasable pen in her hand. When she had surgery for colon cancer, which she recovered successfully from, I remember staying with her to help her recover. When she decided she wouldn't go back to work or drive anymore, she gave me her car. That little car got me back and forth to high school and to work. When I started freshmen year in college, Grammy moved into her nursing home, Kimberly Hall. She viewed this as an adventure, just as starting college was for me. She made friends with her fellow residents, won the spelling bee trophy almost every week, and served upon the residents' council. When I moved back to Connecticut, I would visit her as often as I could. She would always ask me about my life and would give me advice. I would buy books for her at Barnes and Noble; she liked mysteries the best. I still can't go into Barnes and Noble without a quick intake of breath, remembering. 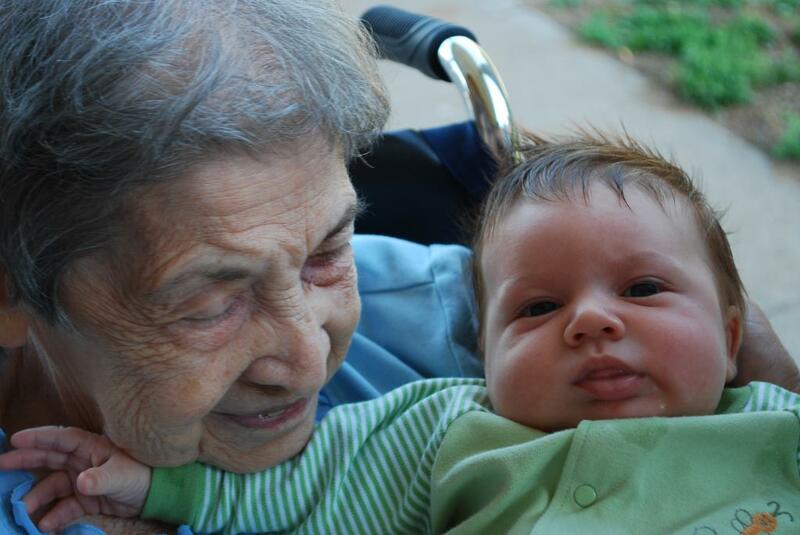 Seth was just four months old when Grammy died. I'll never forget her joy when they were together, they way she held him in her arms and kissed him. She whispered to him, and told him that they had such stories to tell each other. She got so excited when we came to visit, and she always held him tight. 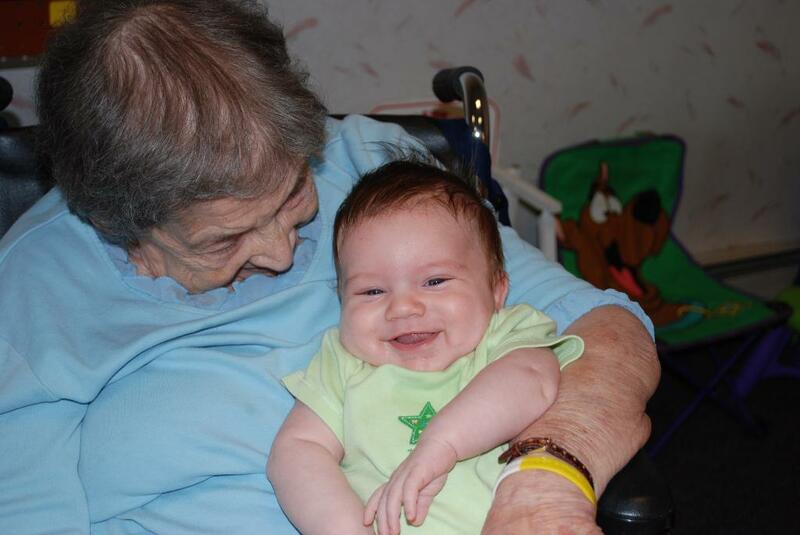 Seth gave his first real smile in Grammy's arms, a moment we have forever documented in pictures. I'll never forget the single wail that Seth gave out during Grammy's funeral service, his own way of saying goodbye. 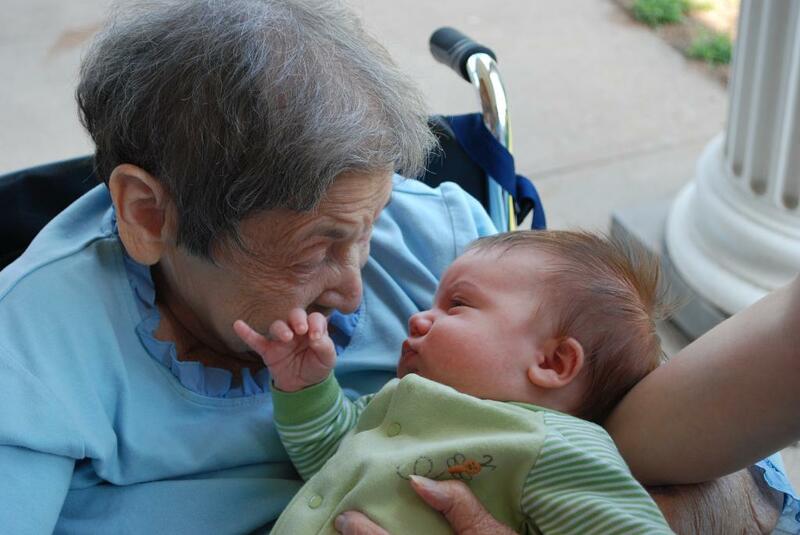 When we look at pictures, he knows to identify Grammy, which means so much to me. Losing Grammy was such a blow. I was so grateful to have had her in my life for so long, but at the same time was so sad for all she would miss. When I was pregnant, we decided on Evan as the name we liked the most. We also wanted to find a way to honor my grandmother through Evan's name. In Jewish tradition, it is a custom to give a child a name starting with the same letter as the name of a loved one who has passed away. At Evan's bris, he was given the Hebrew name we chose for him: Baruch Chaim. The B in Baruch is for the B in Beverly. Baruch means blessed, and Chaim means life. Evan was born on January 18, and in Judaism, the number 18 is a lucky number, related to the word Chaim. The name "Evan" is a shortened form of the Hebrew for John (Yochanan), which means "G-d is gracious." Evan's middle name, "Kainoa," is Hawaiian for "namesake", which goes perfectly with his Hebrew name. All this is an explanation of what went on in our heads as we chose Evan's names, and how we wanted to honor Grammy at the same time. Grammy would have loved Evan - his sweet soft cheeks and chin, his inquisitive nature, his reserved way of taking it all in, his energetic spirit. She would love Seth as a curious three-year-old, and she would love all of us in our family. It was so important to me to have Grammy in my life, and I am so grateful that Seth and Evan have such wonderful relationships with all of their grandparents - Geema, Grams, Papa, Grandma, Grandpa, and their great-grandmother, Nana. These relationships will be just as important to them as my relationships with my grandparents were to me growing up. I never got to meet my grandfather; he died when my mother was in college. I've heard wonderful stories about him, and my hope is that my grandmother is with him now, content, and watching all of our families' adventures. Grammy, I miss you so much. Thank you for all you've given us - Baruch Chaim, what a blessed life!